Habit: Perennial herb from woody base, shrub, dioecious, glabrous or finely hairy, often glandular and sticky or shiny. Stem: generally erect or ascending, round or often striate-angled, generally green. Leaf: cauline, alternate, sessile to short-petioled, linear to (ob)ovate, entire or toothed, distally occasionally reduced to bracts. 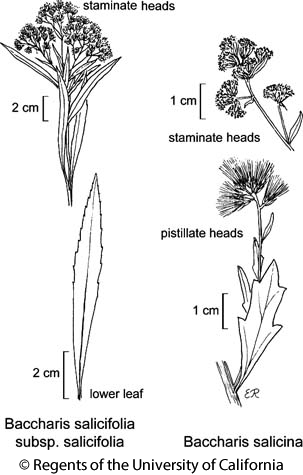 Inflorescence: heads of 2 kinds, unisexual; discoid (staminate) and disciform (pistillate), 1 or in terminal or lateral raceme- or panicle-like or +- flat-topped clusters; phyllaries lanceolate to ovate, graduated in several series; receptacle flat to conic, epaleate, smooth or pitted. Staminate Flower: 8--48; corolla white to pale yellow, 5-lobed; anther tip oblong-triangular; style tips erect, club-shaped or oblong to linear, densely papillate to minutely bristly, ovary much reduced; pappus of many equal bristles. Pistillate Flower: 8--150; corolla narrowly tubular, +- white, lobes vestigial; style branches linear, +- glabrous. Fruit: +- cylindric, 5--10-ribbed; pappus of many bristles, generally elongating and exceeding phyllaries in fruit, +- white to tawny. Habit: Shrub 1--3 m, glabrous, generally sticky. Stem: erect, much-branched, branches ascending. Leaf: short-petioled; blade 25--70 mm, 5--10(20) mm wide, linear-oblong to narrowly oblanceolate, base wedge-shaped, margin toothed distally, teeth 1--3; main veins 3. Inflorescence: heads in tight groups of 3--5 in panicle-like cluster; involucre cylindric to bell-shaped; phyllaries 2--6 mm, lanceolate, glabrous, gland-dotted, sticky, tips acute. Staminate Flower: 20--25; corolla 3--5 mm; pappus 3--4 mm. Pistillate Flower: 25--30; corolla 3--4 mm. Fruit: 1.2--2 mm, glabrous; ribs 8--10; pappus 8--12 mm, elongating in fruit. Citation for this treatment: David Bogler 2012, Baccharis salicina, in Jepson Flora Project (eds.) Jepson eFlora, http://ucjeps.berkeley.edu/eflora/eflora_display.php?tid=1610, accessed on April 25, 2019. No expert verified images found for Baccharis salicina. SCoRI, SCo, WTR, PR, D; Markers link to CCH specimen records. Yellow markers indicate records that may provide evidence for eFlora range revision or may have georeferencing or identification issues. Purple markers indicate specimens collected from a garden, greenhouse, or other non-wild location.